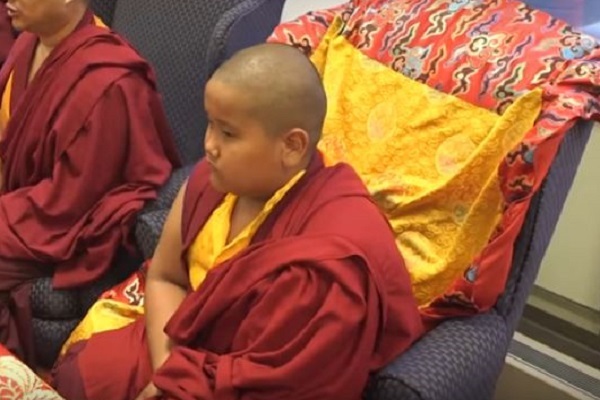 Jalue Dorjee, a 9-year-old from Minnesota declared a Buddhist lama, will soon move to India to live in a monastery. Life as a fourth grader in the suburbs of Minneapolis, Minnesota is pretty simple. They indulge themselves in collecting Pokémon cards, baseball cards, watching videos and playing games on their consoles. However, for nine-year-old Jalue Dorjee, a spiritual perk has distinguished him from the rest of his peers. Jalue has been recognized by the Dalai Lama as a tulku, specifically the 8th reincarnation of the Takshem Lama. Takshem Lama was a Buddhist spiritual leader in the 16th Century. His parents noted early on that their child was special. His mother, Dechen Wangmo notes that her pregnancy was trouble free. Her baby was peaceful and she did not feel sick at all, even in the mornings as is common with pregnant women. She did have strange dreams however, such as one involving elephants: “One night, an elephant appeared with several little ones around it. They merged into the small prayer room in the family home. Once inside, they vanished,” she said. Jalue’s father, Dorje Tseygal also had vivid dreams. An example is the dream where he reportedly saw many lamas surrounded by tall sunflowers. The intrigue as to Jalue’s true identity deepened when a revered Lama visited the community and his parents got the opportunity to share their dreams and suspicions with the spiritual leader. After listening to Jalue’s father speak, the Lama himself experienced magical dreams involving tigers strategically placed in Tseygal’s home later that night. In Tibetan Buddhism, tigers are valued for they are a good omen and signify strength and protection. The Lama proceeded to carry out a practice referred to as ‘divination’ in Tibetan Buddhism. This is a practice that is performed in order to seek advice on important matters that will then be relayed to the interested parties. Using arrows and prayer, the Lama was able to deduce that Jalue was a reincarnation of a Buddhist Spiritual Leader. However, he could not specifically point out which Leader it was. That confirmation would have to wait for the Dalai Lama himself. The confirmation came in January of 2009, when the Dalai Lama sent the family a letter that formally recognized Jalue as the reincarnation of Taksham Nueden Dorjee. In a follow up letter, the Dalai Lama gave Jalue his official name and title: Tenzin Gyurme Trinley Dorjee. Jalue Dorjee’s life would have to go through numerous changes so as to conform to the station and office that the Dalai Lama had accorded him. For instance, his hair would no longer be more than two inches in length, in accordance with customs of Buddhist monks. He will remain in the U.S. to learn proper English until he’s 10-years-old. Then he will go to India to learn in a monastery until he’s an adult. Jalue is currently learning how to read scriptures, and when he’s older he will come to know their meaning.